Brachiosauridae incertae sedis NHM R5937, "The Archbishop", Cervical U in right lateral view. Photo copyright the NHM since it's their specimen. 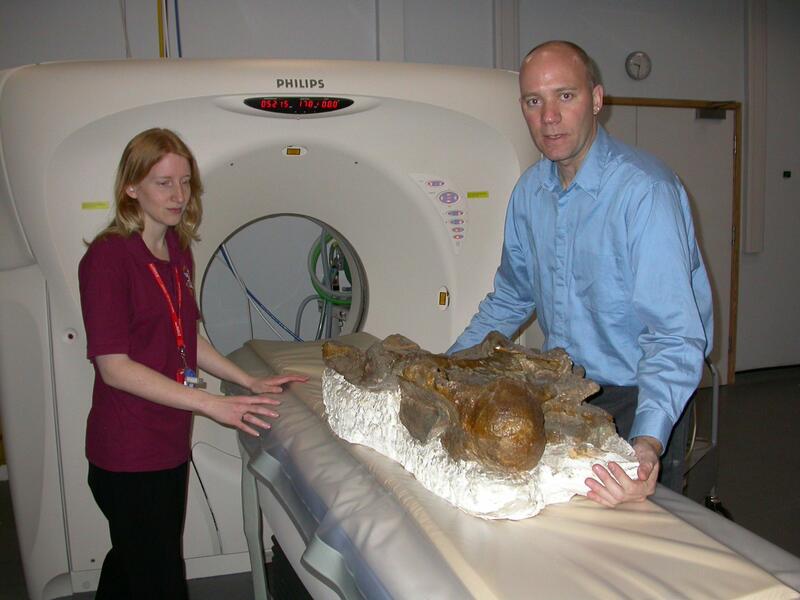 Because my other big goal on this trip was to get it CT-scanned. 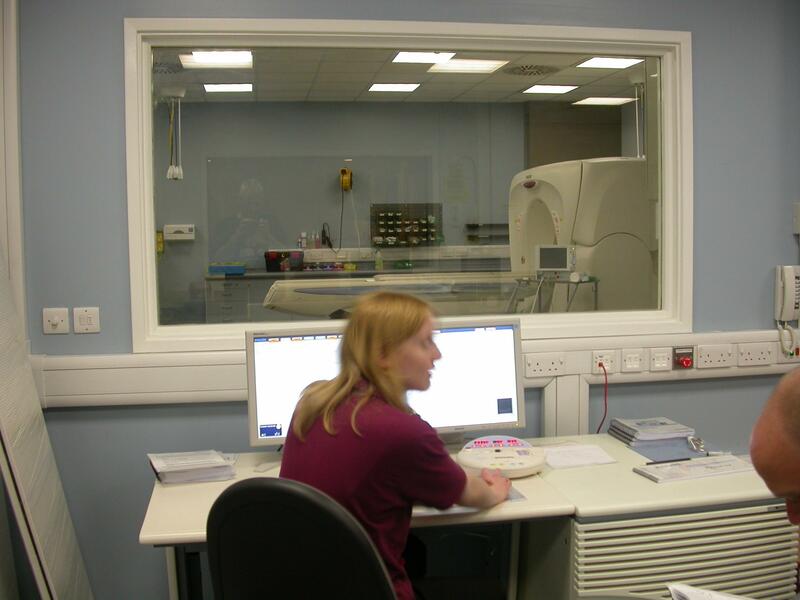 Thanks to the generosity of John Hutchinson of the Royal Veterinary College, and to the help of the NHM people in arranging a loan, everything was set up for my host Vince Bickers and me to ferry the specimen up to the RVC, scan it and return it. The Archbishop, Cervical U, packed and ready for transportation. 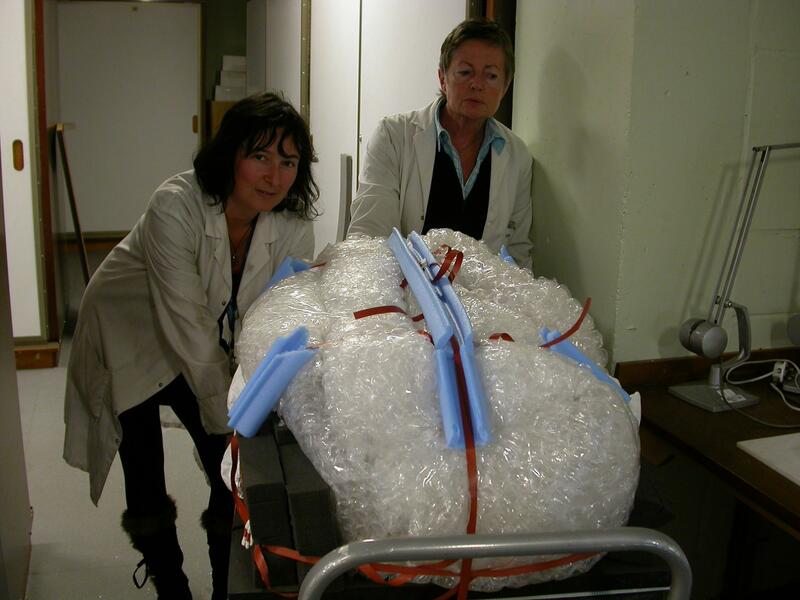 Behind, Lorna Steel and Sandra Chapman of the NHM, who did the work. Lorna and Sandra spent a long time looking for a crate big enough to pack the bone in, but came up empty — there was one that was long enough but not wide enough, one that was tall enough but not long enough, and so on. In the end we sat the bone, on its very solid plaster base, on a plastic pallet, and wrapped it in pillows, bubble-wrap and that blue stuff whose name I don’t know. 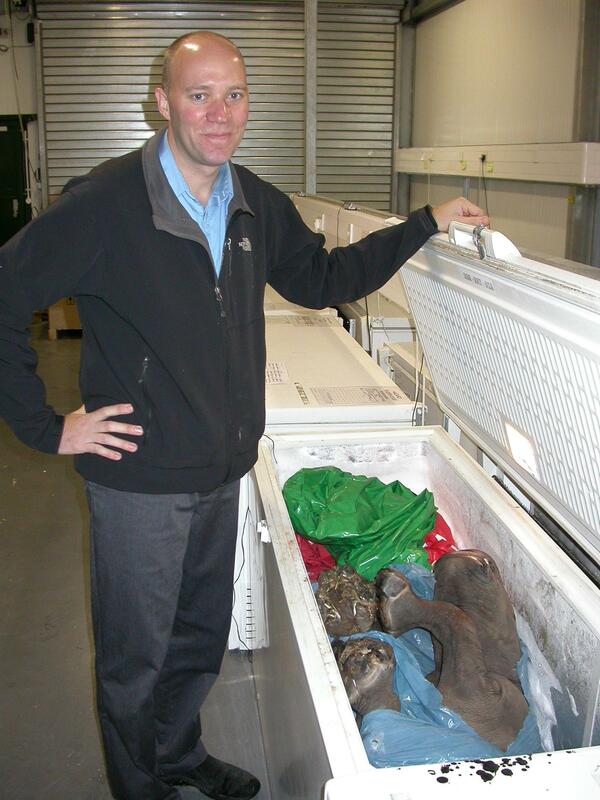 John Hutchinson proudly shows off his dead baby rhino. The Archbishop's Cervical U all lined up and ready to go through the scanner, courtesy of John and radiographer ﻿Victoria Watts. We ran three scans before we got the settings right — we needed more voltage to get through the bone and matrix than we’d first realised, and a filter was causing unhelpful moire patterns. The third scan was definitely the best, and the one I expect to be working with. CT slice through the condyle of The Archbishop's Cervical U, in posterior view. Dorsal is to the left. The grey blobs at the bottom of the image are the plaster jacket that supports the vertebra; the white is bone, and the light grey inside it is matrix that fills the pneumatic spaces. I’m showing the condyle here because its cavities are clearly visible: further back in the vertebra, they are harder to pick out, perhaps in part because of the iron bars scattering the X-rays. It’s notable that this vertebra is less pneumatic than would be expected for a brachiosaurid — by eye, it looks like like the condyle is only 20-30% air, and this slice is not unrepresentative. Most neosauropods would be at least twice this pneumatic, so we may have an Archbishop autapomorphy here. I’ve not yet persuaded 3D Slicer to build a 3D model for me, but I’m pleased to say that before I left RVC, John mocked up a quick-and-dirty render of the bone using only density threshholding, and I can at least show you that. Here we see the bone from the left side, previously obscured by solid plaster. From a single static image, it’s not easy to make out details, but we can at least see that there is a solid ventral floor to the centrum … and that those two crossed iron bars obscure much that we would like to see. You will get more of an idea from the rotating video that this is screencapped from. Looking at this and comparing it with the right-lateral photo at the top of the post, it’s apparent that the density threshhold was set too high when making this model: all the bone along the lower right margin of the middle part of the centrum is good, but it’s been omitted from the model. In other words, the vertebra is more complete than this proof-of-concept model suggests. Hopefully I will shortly be able to show you a better model. Very cool! Interesting tip on gluing the DICOMs together. . .hadn’t thought of that before. BTW, Mike – you probably want to refer to it as “Brachiosauridae incertae sedis”, rather than “indet.” Indeterminate implies that the material is not diagnostic, and cannot be assigned to any genus or species (even a potential new one). 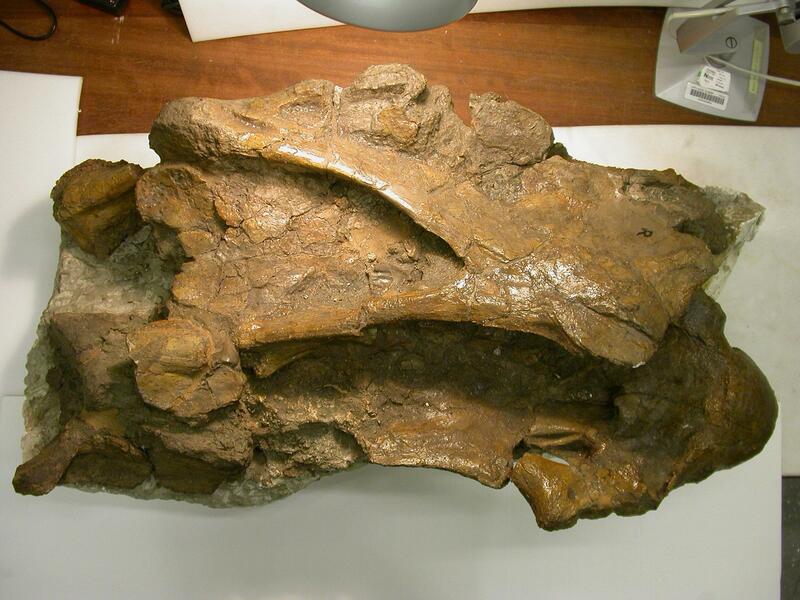 Based on your previous comments on this blog, I understand that you think it will be assignable to a species (perhaps one not yet named), the specimen is better currently filed under “incertae sedis” because it is unassigned within Brachiosauridae, but diagnostic. It was truly an hono[u]r to scan something so regally magnificent as The Archbishop. I hope to scan The Pope someday. And I am pleased that the glory of the Freezers of Awesomeness has been shared with the world. wow. Fantastic… thanks for sharing. Aside from the wonderful pneumatic structures etc, what information is won from the this scan? Does it help assess deformation processes / reconstruction? Randy, thanks for the clarification on indeterminate/incertae sedis — I’ve fixed my caption accordingly. Davidmaas, I really can’t say yet what I am going to learn from the scans. So far I can barely pilot the visualisation program. It’s a bonus that I’ve so quickly been able to identify an oddity, the low level of pneumatisation. 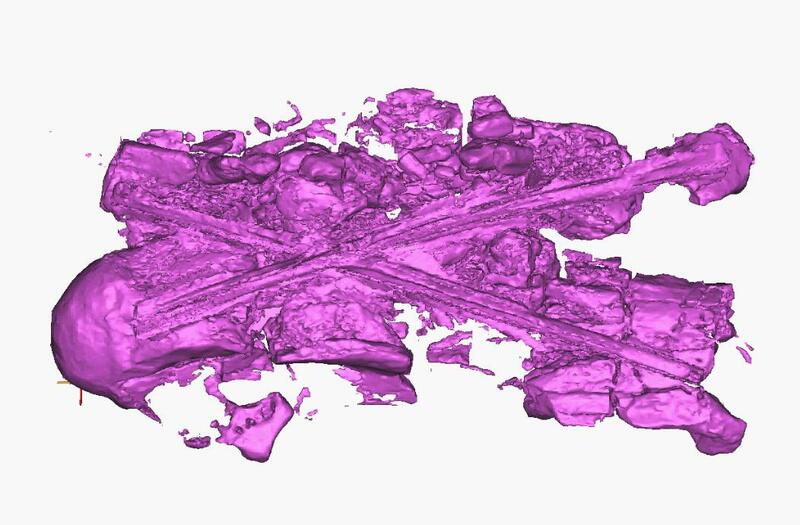 The scan at least underscores some issues with rendering CT of matrix-filled bone (especially of the vertebrae) due to differential permineralization. Relative density of the material also underscores some of the necessary meticulous slice-by-slice modification of the scans in order to compose a model, and was necessary at least for the scan of the skull Sue, given the composition of the Hell Creek sediments (Brochu, 2003). 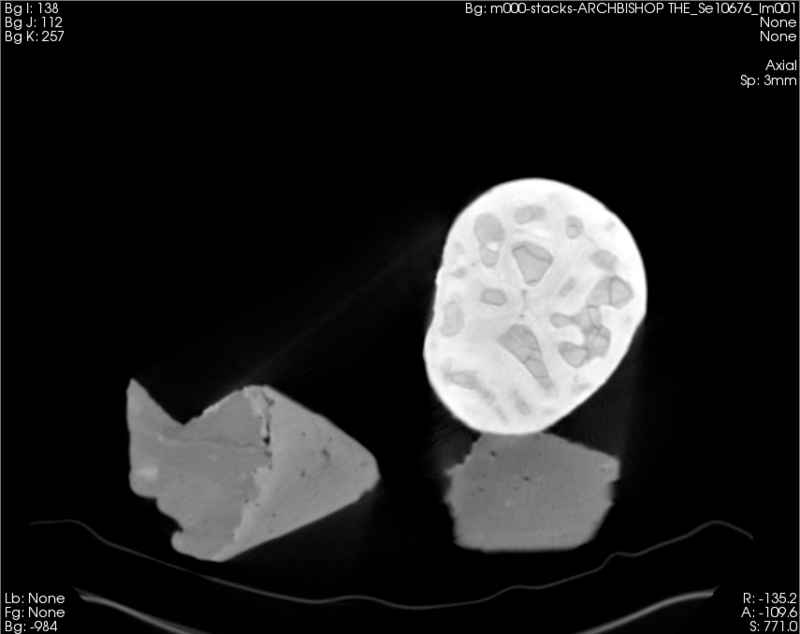 Meticulous editing of the slices by appearance may be required for the bulk of the scan-to-model work, but as you noted, parts of the bone are almost undifferentiable from the matrix, and the result is the scan product above. Low pneumaticity, interesting. I wonder how individually variable pneumaticity was, between different sauropods of the same species? Humans sometimes have weird developmental stuff happen with sinuses, I think; if we had 1000 Sauroposeidons or Brachiosauruses, I wonder what oddities would appear? William, now you are asking one of the key questions: how does degree of pneumatisation vary between individuals? Here are three more: how does it vary along the neck, how does it vary long the length of an individual vertebra, and how does it vary through ontogeny? Then of course there is variation between taxa across the tree. So what we have here is a five-and-half-dimensional space that we want to fill with observations so that we can start to deduce conclusions. Trouble is, there are, so far, 22 published observations (neatly summarised by Wedel 2005:table 7.2), which is not really enough to let us map out 5.5-space! That’s one reason why, at the moment, each observation is valuable — it adds 4% to the total knowledge in the world. John Hutchinson: I hope to scan The Pope someday. I will here predict (without claim) that pneumatization in cervicals will be found to increase progressively toward the skull. The Archbishop, then, will turn out to be relatively proximal. What are those iron bars for, anyway? Is such treatment common, or is this one particularly fragile / friable? I suspect, Nathan, that the bone is in several fragments and the iron bars and the plaster jacket on them is needed to keep it together in one piece. The funny thing is, in a way the name “Archbishop” made sense when I looked at that famous pair of dorsals that have often been mislabeled as B. brancai in books. It looks very vaguely like an Archbishops mitre seen sideways (well at least a Catholic or Anglican one anyway). 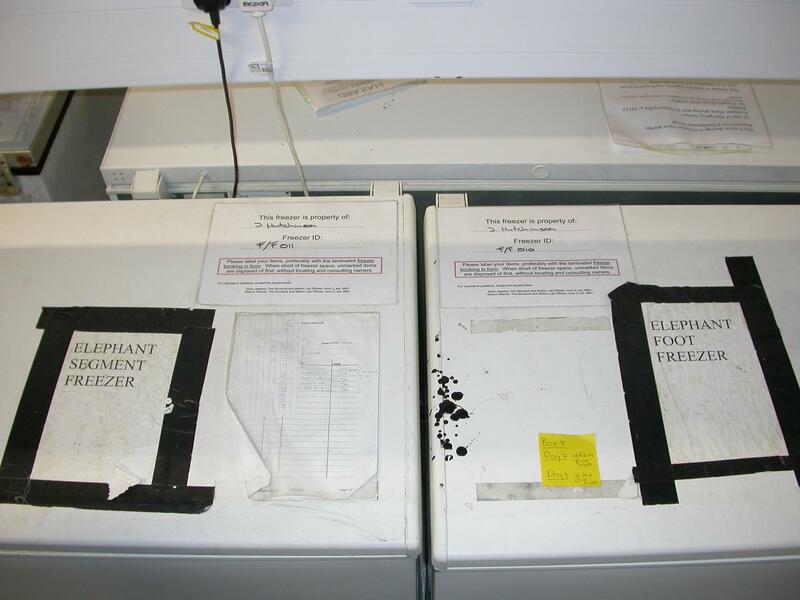 That elephant foot freezer is still stuck in my mind LOL… I’m making that thing my new wallpaper. Nathan, Cervical U seems very solid, possibly because of things that were done to it be preparators rather then because of its intrinsic integrity, so my feeling is that the bars were not necessary — especially in light of how solid the plaster base is. But getting them out again would be a total sod, and I don’t imagine it ever happening. Cervical V was prepped out of its jacket much more recently — a year or two ago — and is VERY crumbly, so maybe U was the same before being consolidated. Future fossils should be braced up with fiberglass. I’m looking forward to seeing what you’re going to name your first dinosaur, Dr. Taylor. With regards to that, I remember Scott Hartman bemoaning the existence of “Reallybigosaur” names such as Supersaurus and Ultrasauros when we were both working at the Wyoming Dinosaur Center, and John Hogbin the molding and casting guy there discussed alternatives with me. He came to the conclusion that we could really mess with people’s heads by simply naming a taxon something like “Bob”. Not “Bobsaurus”, not Bobraptor”, just “Bob”. …Oh, silly me. This would be your second dinosaur, after the most excellent Xenoposeidon. Indeed this will not be the first! In fact, it won’t be the second, either — with Matt and another co-author, I have another new-sauropod manuscript ready to resubmit after rejection and revisions, which I really ought to get done tonight (except that I am having too much fun with the Archbishop to get excited about doing that rather dull job). That one, too, has — if I say it myself — a name that you are going to like a lot more than a Reallybigosaur name. Mike – you’re such a tease! In any case – although the new name you are alluding to is awesome, it could have been even more awesome if you had gone with a different suffix. But then again, I’m biased. I’m with Jamie. Pick up a copy of “Name Your Child”. Practically all of those names are unused and eminently available. It’s your right as the person who did the work to make everybody else say the name you chose. With very short names they have no excuse to abbreviate; for Bob sue, you won’t see any B. s. (so to speak). It’s your job, though, to make Bob sue important enough that they are obliged to write about it, despite their embarrassment. I admit I have toyed with the idea of giving it the name Archbishop. LOL yes, that would be a bit odd… though things like Minmi and Drinker are even odder… And Jobaria and Erketu both basically mean “demon” in other languages… whatever name you pick, Mike, I’m sure it’ll be impressive.